January is usually a time when many of us hit the gym hard in the name of fitness resolutions, and if you're anything like me, three weeks in your muscles are probably feeling all that exertion and in desperate need of some TLC. This is where a product like Dr. Teal's Epsom Salt Soak & Foaming Bath In Lavender (gift set $7.99 on sale for $3.99 at London Drugs) comes in handy. The sample I received for review was a limited edition boxed holiday gift set with smaller versions of each product, but you can also purchase the full-size epsom salts and foaming bath separately. So how did Dr. Teal's measure up? All the details after the jump! Epsom salts—otherwise known as magnesium sulfate—have long been touted for their therapeutic benefits in relieving soreness and aiding muscle recovery. A filled bathtub usually requires about 1-2 cups of epsom salts to fully reap the benefits. 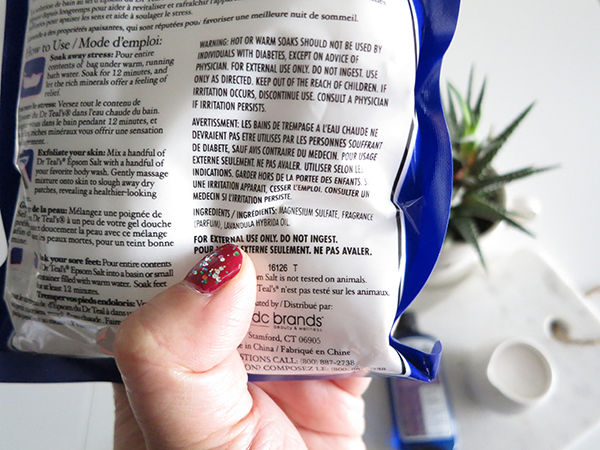 On the back of the package, instructions suggest using a full bag for a soaking bath, using a handful of salts with your normal body cleanser as an exfoliant, or using a full bag in a basin for a foot soak (that seems like way too much product to water). Personally, I found that splitting the 396 g bag in half was enough for me to have 2 baths with a half-full tub. Since finding out I might have endometriosis, I'm trying to be more careful about reading the ingredients list on beauty products; mainly I'm on the lookout for endocrine disruptors. 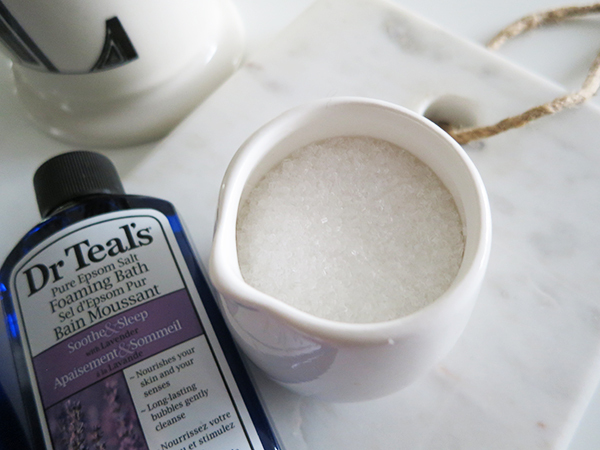 Of the three ingredients in Dr. Teal's Epsom Salt Soak (magnesium sulfate, fragrance, and lavender essential oil), the only one that might be dodgy is fragrance. Aside from being a possible irritant, manufacturers aren't required to disclose what's in "fragrance" as it's considered a trade secret, and sometimes it's used as a catch-all label to disguise dubious ingredients. 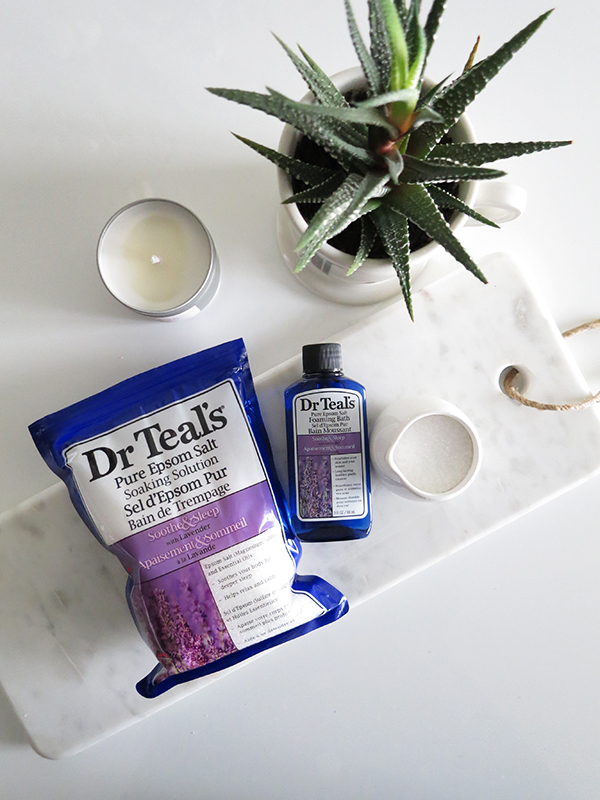 If you have concerns about fragrance, you can purchase the unscented Dr. Teal's epsom salts and add a few drops of lavender essential oil to your bath for the same effect. 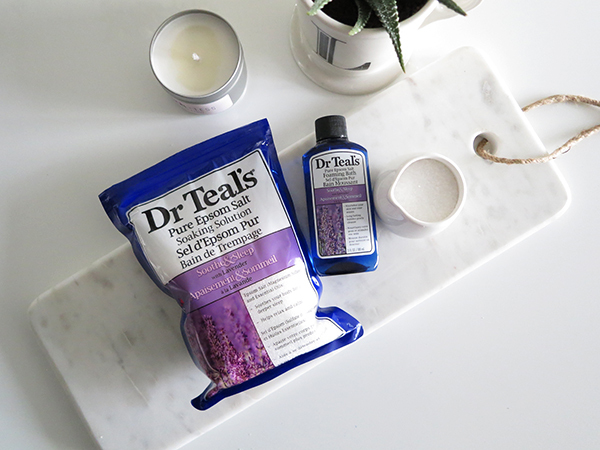 Epsom salts are pretty straightforward—I've used them before and know firsthand how much better they make a hot bath—so I was more intrigued by the small bottle of Dr. Teal's Pure Epsom Salt Foaming Bath in the boxed set. The instructions on the 88 ml bottle say to "Pour a generous amount" into running water, but there are so many sudsing surfactant ingredients in the foaming bath that I think a couple of teaspoons is plenty. In fact, for a product that has "Pure Epsom Salt" in the name, the foaming bath has surprisingly little magnesium sulfate in it. Of the 18 ingredients listed, the ones that raised red flags for me were: cocamidopropyl betaine, sodium laureth sulfate, PEG-80 sorbitan laurate, which are surfactants and possible irritants; methylchloroisothiazolinone and methylisothiazolinone, artificial preservatives that are also potential irritants; and fragrance, which again is sort of a mysterious catch-all. 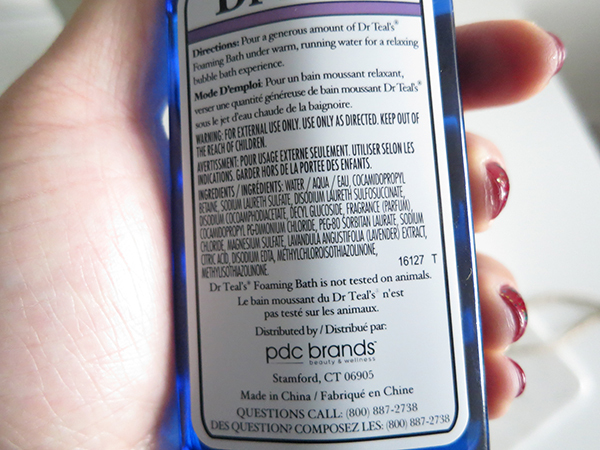 Despite my misgivings about some of the ingredients, I have to say I loved the experience of using these Dr. Teal's products because they did exactly what they claimed. From the moment I sank into the hot, lavender-scented tub of water, I was in pure bliss. Within about 10-15 minutes, my muscles—tense from work and barre classes—unknotted while the lavender scent soothed me into a soporific state. I slept so well when I used this, which is really saying something considering I've been struggling with insomnia due to the medications for my health condition. The next day my body felt loose and relaxed all over, with any lingering soreness noticeably diminished. I thought I could do without the bubbles, but the foaming bath really enhanced the overall experience. Even though I knew the dissolved magnesium sulfate crystals were doing all the work, having the bubbles instead of just lying in a tub of plain water made it feel more spa-like and fun. 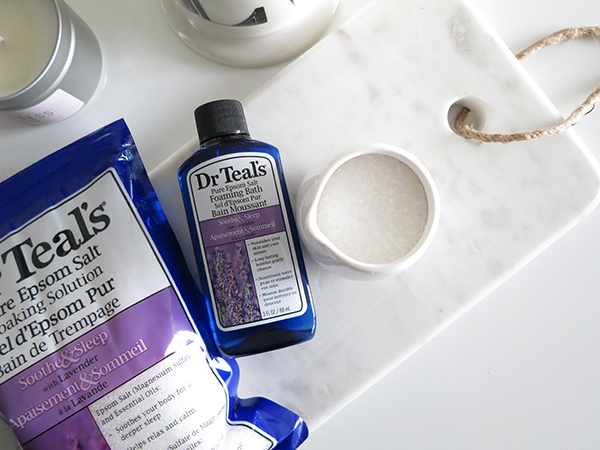 Buy the unscented Dr. Teal's epsom salts and add your own lavender essential oil—just a couple drops will do the trick—while running a hot bath. Use less product than the packaging suggests. Skip the foaming bath. It's mainly there to create bubbles and scent and contains very little magnesium sulfate. But if you do want bubbles, you can also use much less of the foaming bath than suggested—just 2-3 teaspoons—and whisk the water with a kitchen whisk as you run the bath, to create more suds and denser bubbles with less product.